Expectations of a new asset purchase program by the Fed continue to persist as various pundits anticipate its unveiled at the Jackson Hole gathering. CNBC: - Ebullient stock markets are increasingly pricing in the possibility that the Federal Reserve will soon unveil another round of monetary stimulus, Pimco Managing Director Neel Kashkari told CNBC Wednesday. “Those indicators have already priced in … that the Fed should act,” Kashkari said. As a result, the fund manager suggested Fed Chairman Ben Bernanke’s “hands appear to be tied” ahead of a closely watched speech on the economic outlook later this month in Jackson Hole, Wyo. Market participants are looking for a fix, a repeat of the "high" Bernanke delivered at Jackson Hole in 2010 when QE2 was introduced. Markets however are in for a major disappointment because no outright asset purchases will be announced. There are multiple reasons for this, including the fact that real rates are now deep in the negative territory (as discussed here) and the policy as expressed in long-term real rates is far more accommodative than it was in 2010. But what makes 2012 entirely different is that the key concern that pushed the Fed into asset purchases in 2010 no longer exists. The summer of 2010 was marked by renewed fears of deflation driven by credit contraction. The Fed was afraid of Japan-style deflationary pressures that are extremely difficult to arrest as bank lending shuts down. In the months preceding the 2010 Jackson Hole speech, credit was contracting sharply with banks steadily shrinking balance sheets. 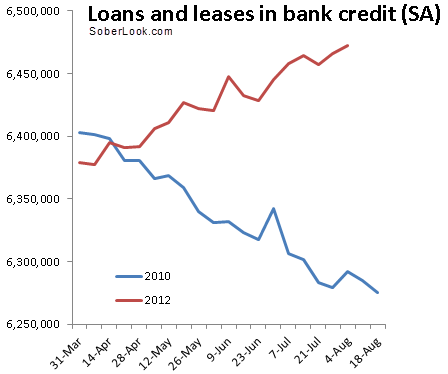 As discussed before, just the opposite is true in 2012 - credit is expanding at a decent pace. The chart below compares the trends now and in 2010. 1. US economic growth has lost some momentum. Growth in employment has been slow and the unemployment rate "remains elevated". 2. Europe poses downside risks. A slowdown in emerging markets is also a concern. 3. The Fed will remain vigilant and expects to maintain a "highly accommodative stance for monetary policy". 4. The Fed is to continue with Maturity Extension Program (Twist) and Reinvestment Policy (reinvesting in MBS to maintain constant balances). That's basically it. If the markets are pricing in more from Jackson Hole - which the recent equity rally suggests may be the case - we are setting up for a sharp selloff in risk assets.